Taking cues from automotive nostalgia, the "Vintage" Series features a shift pattern etched into the surface of the knob. While keeping the pattern from rubbing off, the engraved design also adds that classic feel to any ride. 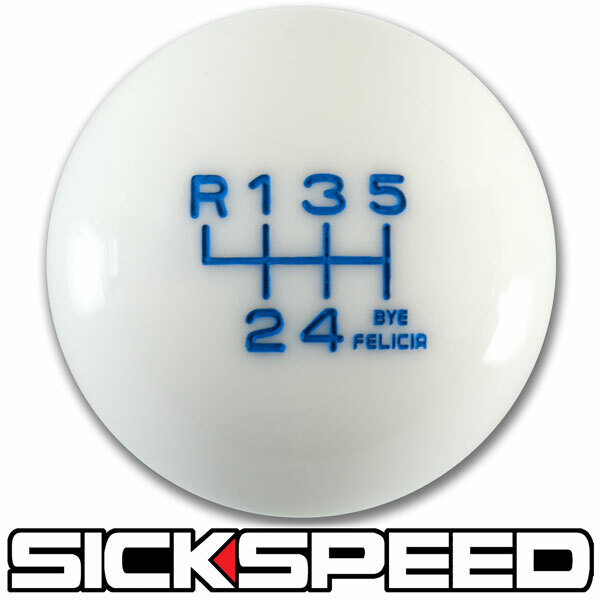 These billiard-ball quality shift knobs are designed to be the HIGHEST QUALITY shift knobs on the market. Made with a super strong single-molecule bond, these knobs stay cooler in the summer and warmer in the winter than any metal knob. BYE FELICIA IS A REGISTERED TRADEMARK OF SICKSPEED! BYE FELICIA proudly displayed in place of 6th gear. This is a 6 speed knob. Reverse is located UP LEFT. Thread pitch is 12X1.25 for the above listed vehicles. NOTE: Listing is for vehicles with THREADED levers ONLY, check our OTHER items for non-threaded. NOTE: Listing is for MANUAL transmissions ONLY, check our OTHER items for AUTOMATICS. Check out the manufacturer's website for more info and pics.